The closing date for signing up for our Boobcamp was on Friday - but we can still squeeze you in. However, we can't guarantee the price of 160 euros because of the hotel's booking limit, but e-mail us if you have any questions! Hurry up! If you still haven't signed up for our Xmas Boobcamp - send us an e-mail NOW! We can only guarantee the low price of 160 euros if you sign up on Friday 7th December at the latest. The e-mail is boobcamp@flcharms.com and you can find all the info you need in our forum. Click here to read it all! FINALLY - we have a new forum! And hopefully, one without spam this time. You'll have to register to leave us a message. A useful hint: If you're asked a question in a language you don't understand - the answer is probably Oslo ;). Good luck and have fun chatting with the girls! Now, off to the forum! FL Charms XMAS Boobcamp - Girls only! 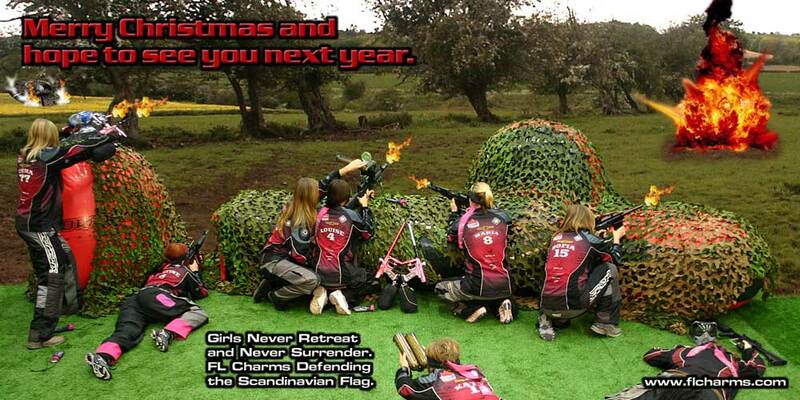 FL Charms will host a very special boobcamp in Oslo, Norway in the end of December, and all female players are invited. Would you like to come and learn from us? Send an email to boobcamp@flcharms.com! Preliminary info is available HERE and updates will come shortly. Put a big, fat X in your calendars, girls, this will be the event not to miss! Off-season has set in. No practises, no tournaments - and so much time! We'd like to share the most memorable moment for FLC in the 2007 season with you. Here are some of our private pictures from Nürnburgring, Germany - where we took 2nd place in Division 1! Enjoy! The Millenium Series is over for this season - but we can still share some happy memories with you! Here are some pictures from Toulouse. Did we catch you on film? Have a look! We didn't make it till Sunday this time, but as a treat to all our very supportive fans, we have some pictures for you from this weekend - we are just minutes away from leaving for the players' party - we're sorry you're not there partying with us! Watch the pictures in our gallery! The morning started out with the site opening half an hour late, the darkness lifted just before 8 o'clock and you couldn't see across the field because of the fog untill well after 10 o'clock. Other than that, the day was ok. We didn't get it all working for us on the field, so the results of the day is 1 draw, 2 wins and 3 losses (yes, we played 6 games today. I guess the huge M5 division is the reason why the divisional games are rushed this way). Tomorrow, we have two games in the afternoon - wish us luck! Paris always keeps her promises and is beautiful as ever! The site is in front of the entrance to the Disney parks, the fields have turf and it's looking good :) We play tomorrow morning and we cross our fingers that the mist we had this morning leaves before our first game. Which, by the way, is against our dear practise partners, Örebro Malicious. The ladies played the Swedish Hype, a leg in the 3KC (Three Crown Cup) two weeks ago. The format was SPL and the team hauled in a convincing 5th place in competition with experienced X-ball teams as Joy Division and Ugly Ducklins. As we speak, the FLCs are heading for Paris, for the last event of the Millennium Series this season. Hope to see you all there! FLC played Sunday in both London as Belgium, and is preparing for Paris as we speak. 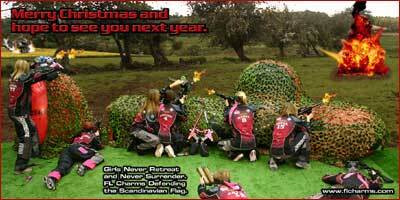 The ladies played the Norwegian National Paintball Championship at the end of August. The format was X-ball light, where the winner was first team to take three points in each match. FLC took a decent 6th place! And yes, we finally managed to pin her down on a wallpaper - Maria and her smoking two friends. ;-) Just click here! If you know Norwegian or Swedish - read all about it in our article collection! Our good friend and excellent photographer Erik Chateau from France has sent us new pictures. Enjoy the ladies of FLC in action at the Millennium in Toulouse and in Nurburgring! FLC took second place in D1 at Max Masters in Germany!!! The season has started! Toulouse didn't bring out the best in us, but we'll be back stronger in Germany. Congratulations to our friends in B4 for their excellent result! As for us: we'll be practising at the Wizeguy's field this weekend! And on Sunday from noon, it is open for walk-on. Be there! Excited to see what happens in Toulouse? So are we! Only one day away until we are back in the very first city the team ever attended a Millennium event. To ease the pain of waiting, we have new photos for you. Dan Randon is the photographer and UK Masters is the event! Are pink shockers part of your wet dreams? Now, your dreams can be fulfilled! After the Millennium event in Toulouse this weekend, we'll have pink shockers for sale. Send us an e-mail on order@flcharms.com to make sure you have a spot on our waiting list for those lovely pink FLC custom made shockers! Check out the "For sale" section for details! Organizing an outdoor practise this early in the year and with people coming in from three countries is a logistics challenge - but this weekend, we finally managed to assemble all the neccessities. Big thanks to the Swedish teams Royal and Malicious! Wanna see what we were up to on our trip to the US of A last fall? Have a peek! Its been quiet here lately...but now we have stopped eating ginger bread and x-mas chocolate and finally decided to update our web site. You can now read about our little US trip in the event report.